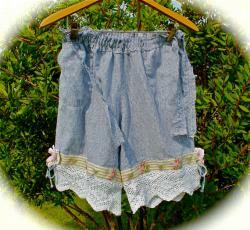 Sweet shabby chic rustic romantic bloomers crocheted details flowers rustics cowgirl chic mori girl. 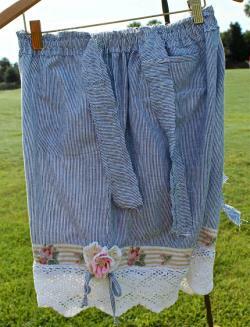 Sweet heart, rustic, tattered, striped, bloomers of light weight striped, linen. 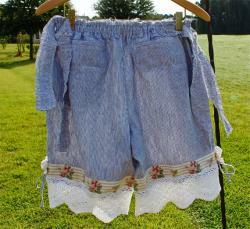 Wide -tattered and rustic -elastic waist with ties. Hand me down softness and rustic charm. 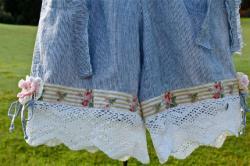 Scalloped, crocheted bottom edge with. Rustic floral striped band and. A large crocheted blossom with a red ribbon rose center. Waist band measures 26" flat and when fully stretched they measure 38". About 3" below the top edge hips are 38". I'm always happy to assist you and any questions.